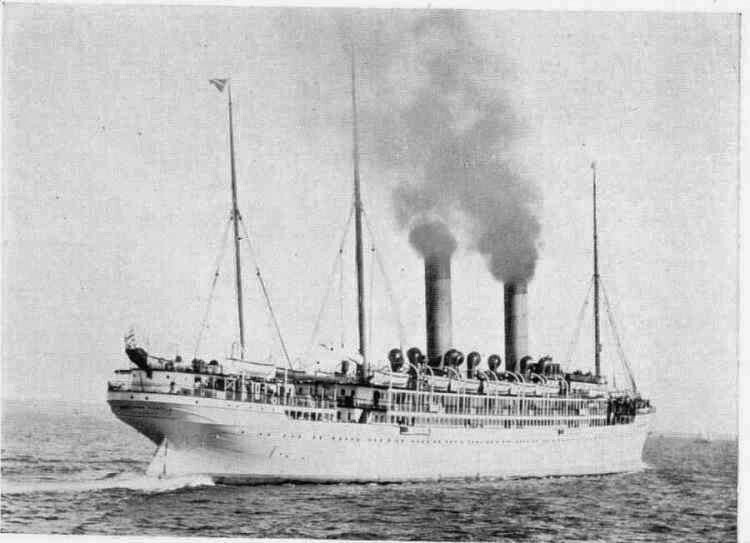 In September 1914, South African forces prepared to destroy the Swakopmund harbour facilities and wireless station by naval bombardement. 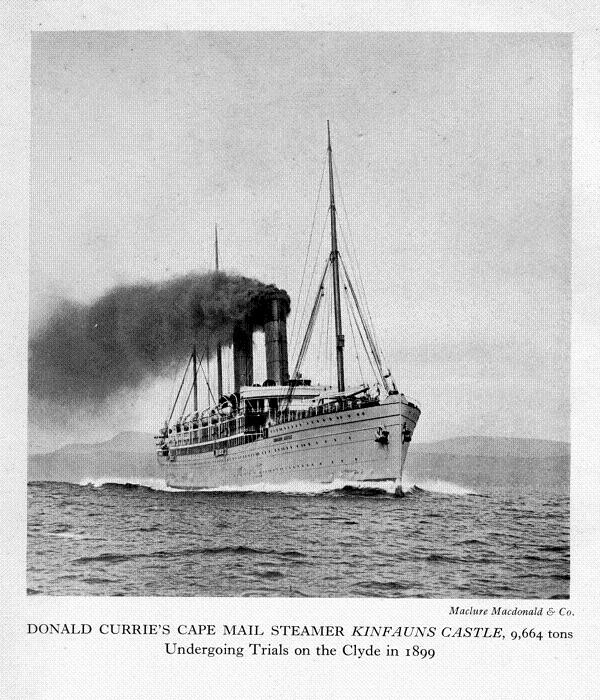 On the 22nd September 1914 the Whaler “Vaila” manned by members of the the armed merchant cruiser Kinfauns Castle, left to reconnoitre off Swakopmund. The bombardment was performed on 24 September 1914 by the British warship, HMS Kinfauns Castle. At 11:03 am The ship fired 9 Rounds (Common Shell) towards the end of the Pier. They seized fire when a Flag of Truce was observed ashore. At 12:20 a boat brought Town Officials, the Judge, Mayor and a Town Councillor who were allowed on board under the flag of truce. The delegation was informed that the Pier will be shelled at 14:00. At 14:02 shelling started and seized at 14:23. The pier was left smouldering and the cranes wrecked. The Harbour Warehouse (where the Swakopmund museum is today, was also destroyed. During the bombardment 38 rounds (Common) and 16 Lyddite shells were used. The Kinfauns Castle returned to Walfish Bay. No mention is made of the Radio Station. 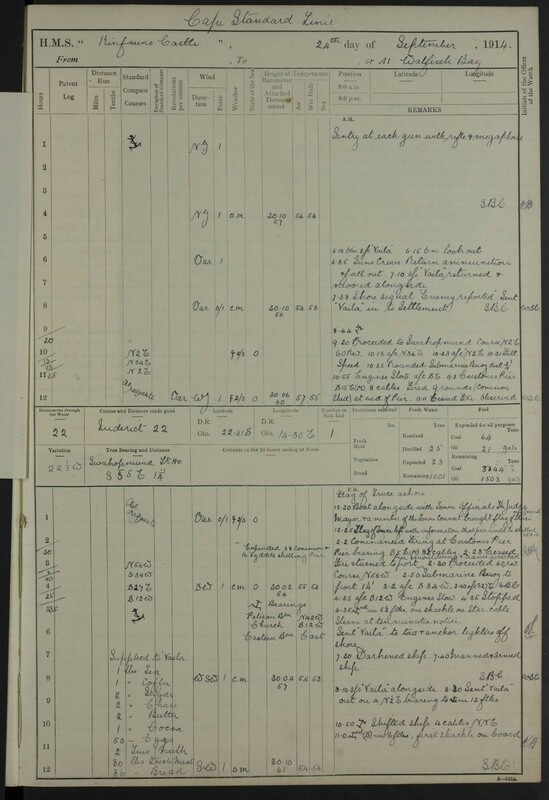 Below is the extract from the ships log on 24 September 1914 covering this incident. 1.0am: Sentry at each gun with rifle and megaphone. 6.10am: Observed SS “Vaila”. 6.15am: On look out. 6.35am: Guns Crews Return ammunition and fall out. 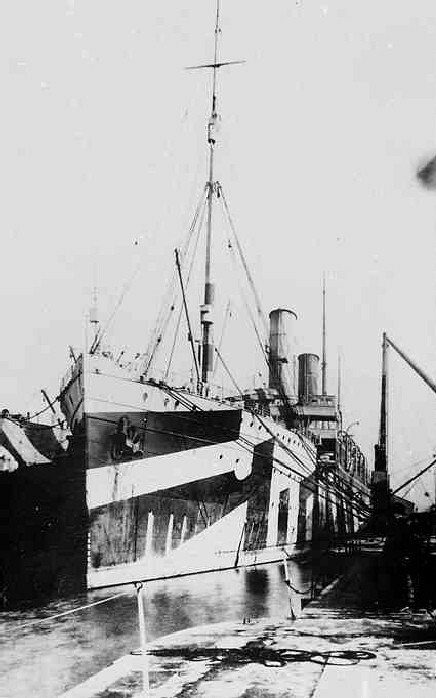 7.10am: SS “Vaila” returned and moored alongside. 7.38am: Shore signal “Enemy reported”. Sent “Vaila” in to Settlement. 9.20am: Proceeded to Swakopmund. Course N2E, 60 Revs. 10.18am: Altered course N34E. 10.23am: Altered course N2E. 10.31am: Full Speed. 10.35am: Rounded Submarine Buoy distant 0.75 miles. 10.55am: Engines Slow, altered course SE. 11.3am: Customs Pier S15E (Magnetic) 8 cables. Fired 9 rounds (Common Shell) at end of Pier. 11.11am: Ceased fire. Observed Flag of Truce ashore. 0.20pm: Boat alongside with Town Officials, The Judge, Mayor and a member of the Town Council brought flag of truce on board. 0.25pm: Flag of Truce left with information that pier would be shelled at 2-0[pm]. 2.2pm: Commenced firing at Customs Pier. Pier bearing S5E (Magnetic) 8.5 cables. 2.23pm: Ceased fire and turned to port. Pier smouldering and cranes wrecked. [Expended 38 Common and 16 Lyddite shelling Pier. 2.30pm: Proceeded 60 revs. Course N56W. 2.50pm: Submarine Buoy to port 1.25 miles. 3.2pm: Altered course S34W. 3.40pm: Altered course S27E. 4.25pm: Altered course: S12W. Engines Slow. 4.35pm: Stopped. 4.35pm: Anchored in 5.5 fathoms, one shackle of Starboard cable. Steam at ten minutes notice. Sent “Vaila” to tow and anchor lighters off shore. 7.30pm: Darkened ship. 7.40pm: Manned and armed ship. 8.30pm: Sent “Vaila” out on a N.05E bearing to anchorage in 12 fathoms. 10.50pm: Weighed anchor. Shifted ship 4 cables NNE. 11.0pm: Anchored (Starboard) in 6 fathoms, first shackle on board. Information from http://www.naval-history.net. Accessed on 7 February 2018. More information about the Kinfauns Castle. 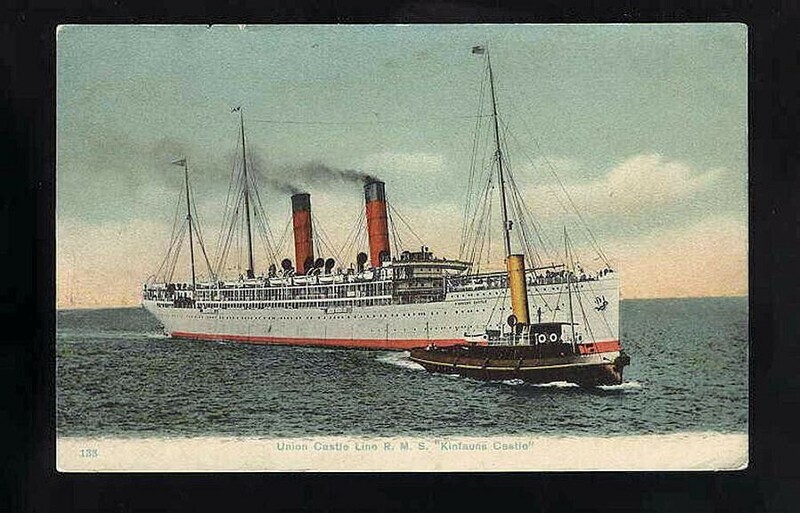 Built 1899 this Union-Castle Line vessel was taken over by the Admiralty on 4th August 1914 she was requisitioned by the Admiralty and converted into an Armed Merchant Cruiser for service in South African waters. In this guise HMS Kinfauns Castle was involved in a number of actions, capturing several German vessels and two German islands. 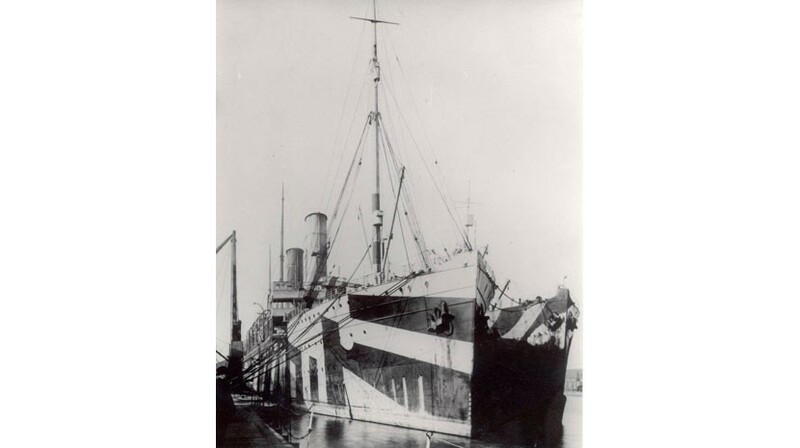 In 1916 the vessel became a troopship and returned to the mail service after the end of the war. For the period commencing 8th of August 1914 and ending 30th of April 1915.